Riley “Rocky” Stone, a twelve year old boy on a family vacation in Arizona, finds what he believes is an Apache arrowhead while hiking with his grandfather and family in Arizona’s Superstition Mountains. When Riley returns to his home in Chicago after the vacation he closely examines his arrowhead. He discovers that one side has etchings of three circles—two small and one large. His grandfather had explained to him that the Native Americans communicated with crude drawings using circles and stick figures; the circles representing stages of life; a figure drawn upside down meant death. When Riley rotates his arrowhead where the two smaller circles sit atop the larger circle he sees death replaced by the image of Mickey Mouse. Riley’s grandmother in Arizona notifies her family that she has won a trip for all of them to go to Disney World. Riley senses trouble and doesn’t want to go. His father informs him that he has no choice. Once at Disney World, Riley has a desperate urge to ride the Thunder Mountain rollercoaster in the town of Tumbleweed. Before boarding the ride with his cousin, William he tosses his arrowhead into what appears to be a well for drawing up water and makes a wish. During the ride through the darkened, twisting tunnels of Thunder Mountain, Riley finds himself being tossed about in the rollercoaster’s car. A violent surge seems to lift him out of the car. Before he realizes what has happened, he finds himself back in the Superstition Mountains on the same trail where he found his arrowhead. Only now he finds much more. The much more is an old bearded miner who identifies himself as Jacob Waltz. Jacob calls himself “Dutch” and he lives in the tunnels of a mine he has dynamited and dug out of the mountain. While with “Dutch”, Riley survives being attacked by three renegade U. S. Cavalry soldiers who were AWOL from the Army. As Riley becomes more familiar with his new home in the mine, “Dutch” gives him a nugget as a souvenir. The odd colored chunk of stone barely fits in the palm of his hand. Riley, while exploring outside the mine with “Dutch” is away, meets a Mexican brother and sister who are about his age. 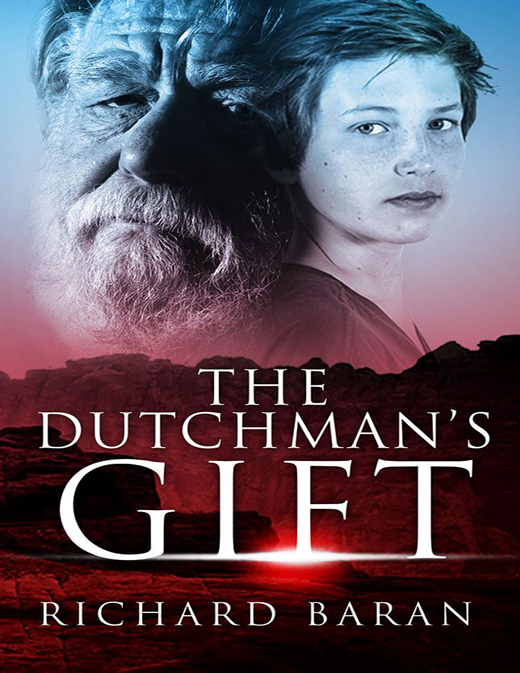 They are part of a family of Mexican miners who are digging for gold and in search of Jacob Waltz’s mine, “The Lost Dutchman” that is rumored to possess unheard of wealth. Riley and his two young friends survive an attempt on their lives by an Apache scouting party and flee to the location of the Mexican mining family on the Indian ponies. While heading for their family, Riley’s two friends tell him of a rundown ranch belonging to a sightless old man named, “Blind Charlie” who is called Evil by the Indians. The Mexican miners attempt to hold Riley and have him take them back to the “Lost Dutchman Mine.” Riley, with the help of his two friends, flees on horseback in the direction of the rundown ranch. A band of Apaches in search of their missing scouting party spot Riley on one of their ponies and give pursuit. With the help of “Blind Charlie,” he finds temporary safety on the Evil ranch. The marauding band of Apache warriors ignore the evil curse and bad medicine attached to the ranch and “Blind Charlie” and set fire to the ranch house with Riley and the old man inside. “Blind Charlie” acts as a decoy and helps Riley escape on his Indian pony. As Riley heads for the Mexican border with several Indians in pursuit, he finds himself back on the Thunder Mountain roller coaster at Disney World. He tells his story to his family and even shows them his souvenir nugget. No one believes him except his grandfather who knows the value of the nugget.